With three ingredients you can create this nutritional boost! 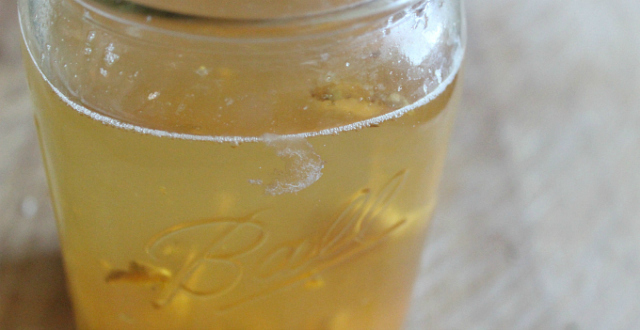 Learn how to make fermented turmeric! 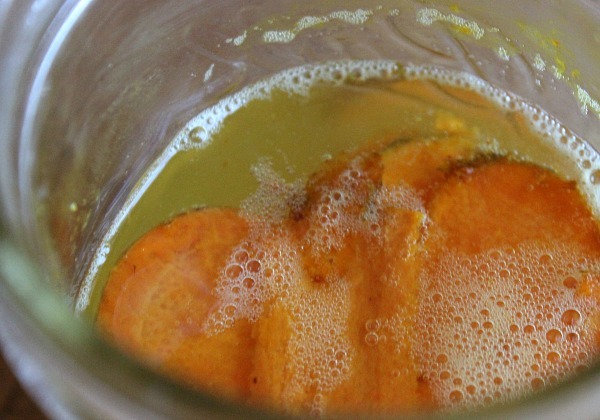 This is a simple way to ferment turmeric. Ginger may be added or substituted. Place the freshly grated turmeric and/or ginger in bottom of wide mouth quart jar. Cover with cloth and rubber band. Place on shelf out of direct sunlight. After 24 hours add 1 tablespoon grated turmeric, 1 tablespoon powdered turmeric, and/or 1 tablespoon grated ginger. Add 1 tablespoon sugar. Stir well. Replace cloth cover and leave on shelf. Every 24 hours add 1 tablespoon turmeric or ginger, and 1 tablespoon sugar until you see bubbles on the surface of the water. This generally takes several days. You may add additional water if desired. I have done it both ways with success in each case. Cover with a cloth and rubber band. Place on a shelf for two days. Transfer jar to the refrigerator. For added potency consume fermented turmeric with black pepper. Piperine, a key chemical in black pepper, enhances bioavailability of turmeric. I have also successfully used honey as the sweetener. I find the honey fermentation more appealing. Wondering how to use your fermented turmeric? It makes a great skin toner! For more suggestions, see 4 Ways to Use Fermented Turmeric. I’m so excited to try this out! I have some great turmeric powder and an organic apple waiting to be turned into a bug, but I’m not really sure how to go about it all after it’s made. So when I take, say, a cup of liquid out, I just replace a cup, and also put 1T turmeric and 1T sugar (or I guess more, for a cup of water)? So replace everything every time I take any out? Sorry if that’s confusing! Thank you for any help! I get your question. I will adjust the post to help clarify. You can keep adding till you have your desired amount and then use it and start over. To keep a “continuous brew” you do exactly what you’re describing. Take some out and replace with those quantities and allow it to ferment. You shouldn’t need any more apple since the brew is going already. Let me know if you have any other questions. Sure, Barb. It’s all trial and error until you find what works. I’m also very excited about this! I’ve made kombucha in the past, and am always looking for healthful experiments with unique flavors. I’m wondering though, is there any way to tell if the bug is ready, besides “seeing bubbles on the surface?” Will I be able to taste a strong result? Also, I assume that if left too long without food (sugar) the product will lose potency and grow moldy. Have you experienced this? I’ve not had it grow mold. I have kept it fairly well fed. The only thing I’ve noticed is that when I leave in the fridge for an extended time it seems to lose its zip. The bubbles have indicated success for me. I have pH strips – I haven’t used them to test though. I test the pH when I’m uncertain. I have a ginger bug that I got going, and have used it to make fermented drinks a few times. It is stored in the fridge when not in use. One day when I opened the starter to use it, I was told it smelled alcoholic. A device that is used for detecting alcohol was put over the top of the starter. It read that there was alcohol present. Now it doesn’t say how much alcohol, it just detects its presence. So my question is, is this normal? Did I somehow make or handle this incorrectly? When yeasts start to dominate alcohol is formed. Eventually the bacteria will win out and the solution will become more vinegary. If you want to save this I would suggest putting it back out at room temperature and let it ferment some more and see if the bacteria start to dominate. Again – it will become more like vinegar and may not be appetizing but the alcohol should dissipate. The other option is to pull it out and start feeding it again to see if you can restore a balance that you like. Some of these ferments have a small alcohol content and are still beneficial. But if it’s too strong for your senses I would guess it’s too strong for your body too. Hello. I am reading posts to start with fermentation because I know they are benefical for our health. What I want to ask you is: how do you use this”bug”? Or what do you cook with it? Because the fermented vegetables can be eaten like any other vegie. But, what about this turmeric/ginger recipe? Thanks for help me to start with this new topic in my kitchen. Hello Andrea. As I mentioned before I have been fermenting turmeric and ginger for about two weeks now. I do them separately, then blend together. I use for each one, 1 and 1/2 cups of distilled water and I use organic brown sugar. I also use fresh turmeric and ginger. I’ve done it now 3 times and this last one took 5 days. And that is exactly how I drink it. My personal opinion is not to heat it, because it may destroy the curcumin. This is where it gets tricky, because I know there are certain things that need to be heated and others not. Yesterday I made a turmeric paste. I heated the water to 120 degrees and made it from there. I know heat will destroy water soluble vitamins, but I am not sure about curcumin. I do know it is an antioxidant, and heat, too high heat, will destroy it. Anyway, the main reason for my message was to let you know that I have read several recipes on preparing this particular bug and yours is THE VERY BEST!! You explained it very well, and the real touch was the photos. I was very impressed. Thank you very much for that. Anyway, that said, do you have any ideas on the subject of heat? 120 degrees isn’t too high. Enzymes are killed at 118 degrees so that’s not too much higher. The probiotics can be killed off at 115 degrees from what I understand. I have a hard time believing everything good that is in turmeric is killed off with that kind of heating. But I haven’t done a lot of research on that. It’s a great question, though. Thanks for the encouragement on the recipe! I fermented Tumeric, Ginger, Apples and cayenne….. All the apples dussappeared from the jar after two weeks!!!! Someone brought up an apple. Did I miss something in the recipe? A bit of apple can be added if you are using turmeric powder to help the fermentation along. I still do best with the root – but it’s a suggestion if powder is all you have. I really like your passion for turmeric, my very favorite spice. Thank you for the post on making a bug. Both turmeric and ginger can both grown easily in a five gallon bucket, and with this you can make fermented turmeric tea aka fermented ukon as the Okinawan centenarian’s drink on a regular basis. I had not heard of ukon! Thank you for the tip!! What size container do you recommend? Would it make a difference to use an airlock? And have you ever used it for marinading e.g. tempeh? I use a quart size mason jar. An airlock might favor some microbes over others- but honestly might be just fine. It’s worth trying. You may prefer it with an airlock. I have not tried marinading. That’s a great idea!!! Will honey work as well or does it have to be sugar or salt? I tried it with honey and loved it! I think it tastes better and it fermented quite well. I would very much like to know if honey will work. I know honey works with kombucha so I assume it can work here too. I agree. I’m going to try it. Thanks Marie. Can I use a fido jar instead of using a cloth to cover or will this not allow air? Also once the bug is bubbling and complete, how much black pepper do you recommend to increase potency? As much pepper as you think, honestly. I’m not sure, I go by instinct. As for the fido jar, it should still work fine even though it is airtight. I am not sure if I missed an update, but I would like to know if you did happen to try it with honey yet, and if so could you explain how it fermented differently or not? It should work just fine but I’m putting it on my to-do list this week and promise to report back, Laiah. ??? I’ve been diagnosed (in the last 3.5 months) with psoriatic arthritis, plaque psoriasis, hypothyroidism, SEVERE (my #15; average is 115-129) Vit D deficiency, chronic degenerative back disc breakdown & bulging from L3 down & nerve impingement between the L5 & S1 from an MRI this past December. I also had a tonsillectomy and adenoidectomy last May. When issues began 2.5 yrs ago, (*also, 38yrs old & 100% incontinent ✌) I’ve just been passed from Specialist to specialist and have been put on 5 couses of oral antibiotics, 2 topical antibiotics, a topical Rx antifungal (??) & Doxycycline! Then I rememered how much Acupuncture & Yoga were so effective about 8-9yrs ago. I researched Eastern Medical Practitioners. I said I am going Holistic, Functional medicine from now on. I’m using turmericgl, tea tree, ginger, clary sage, geranium, Cedarwood, Ylang-ylang & Apple Cider Vinegar, coconut oil and so many others, but the bottom line is every doctor (East/West) first ALL think I’ve been out of the country due to the systemic, gross, unknown/ not treatable- by reg Rx, acupuncture, oils, herbs, etc- infectious sores..not infectious to anyone else. But I’m not infectious to anyone else; but only to me disease and I wanted to see if you had any ideas: overnight I get these large (dime size) perfectly circular deep holes like gouches on my leg that have…gelatinous kind of dewey material- moves- and they can’t figure it out and they did all the stool samples that did all the other and they said there’s some systemic infection and I’ve been doing holistic healing acupuncture I practice yoga it seems to be helping and have to get a hysterectomy in about a week it because it’s necessary I have been having hemorrhagic bleeding and I think the infection is in there from what they have seen and I have taken video of and I want to know I guess what oils herbs that you would suggest to injest but also to place on these sores that I don’t know what to do with because they just stay open and I can’t put a bandaid on the skin- it is so paper thin it just rips further and I can’t go where any go swimming or wear shorts or do anything of the like because essentially I have legs that are gruesome looking. and so that stuff this it’ll have to be infectious diseases specialist and I know for the thyroid and the hemorrhagic bleeding has to be done in the hospital but holistic is giving me the most help do you have any suggestions going on almost 3 years and I can’t DEAL anymore. Thank you; any ideas would be do helpful & appreciated greatly!!! If you have some sort of answer you could possibly go into history books as no one else has??? I don’t have any specific suggestions, Lauren. I’m sorry to hear all of this. I think you’re on the right path with the alternative medicine options. They are far more holistic in their approach and thus approach healing very differently. 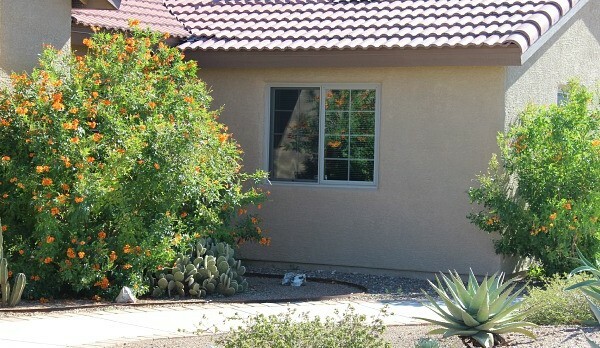 Environmental is critical to recovery. 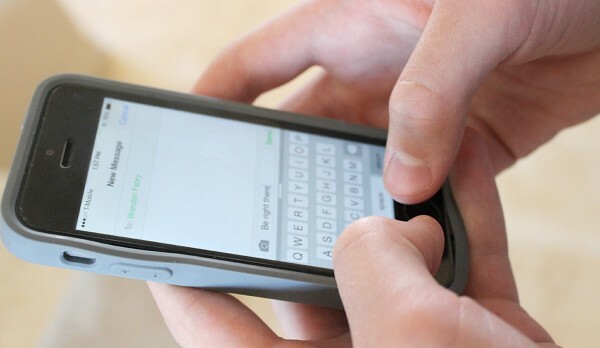 You’ll want to be aware of any potential mold issues in your home as well as high exposures to electromagnetic radiation in the form of nearby cell towers, smart meters or high voltage power lines. With all of these antibiotics, this probiotic can help restore the gut. It’s so tough. I feel for you, Lauren. Lauren, I don’t want to shock you, but have you looked into using one of the oldest techniques on earth – Urine Therapy? Don’t take my word for it – just know that it is used in countless medications and since no one can charge a dime for it, the medical-pharmaceutical world won’t support it. There are quite a few books, but the easier to read is “the Golden Fountain” by Van der Kroen (he explains how it works and how to do it) and “Your Own Perfect Medicine” by Martha Christie (she has hundreds of medical studies/applications as well as case studies). Don’t believe Wikipedia who says it has never been studied – I was shocked to hear that- it is simply untrue, as you will learn should you look into it. It is easy, free, and you’ve got the medicine at hand, always. We have been conditioned to aversion but urine is sterile (waste is excreted through GI system, not the kidneys) and urine is simply the excess water, vitamins and hormones you have too much of for the body to process at that moment – it is not waste; it is the water of life. Good luck. Dear Lauren, I came to this site interested in how to ferment turmeric as I have fermented lots of other things using lactofermentation with Kefir. But I read down the comments and my heart goes out to you. I suppose you may never come back to this site, but just in case, I write. I am a missionary (toeverynationministries.org), my father was a medical missionary, and am aware of the urine treatment with positive results. There are other things that could help as well, definitely try an alternative healthcare professional. I would try out Mercola.com with the nitric oxide dump simple exercises, along with diet and Dr. Steven Gundry supplements, or Aroga supplements. I have a Vietnamese MD friend who highly recommends alternatives. Most of all, tune into what Jesus is saying to you… through friends, prayer, dreams, the Bible, spontaneous thoughts that He drops into your heart as you are asking for answers. I am praying for you as I go to prepare my turmeric root… Thank you for this clear explanation, Andrea. Hi! This is awesome! How long do you reckon its shelf life is? Will it continue to ferment to alcohol like kombucha? I refrigerate it after a few days to keep it from fermenting further. If you leave it out – yes it will continue to ferment. Good question. Greetings from warm Indonesia. 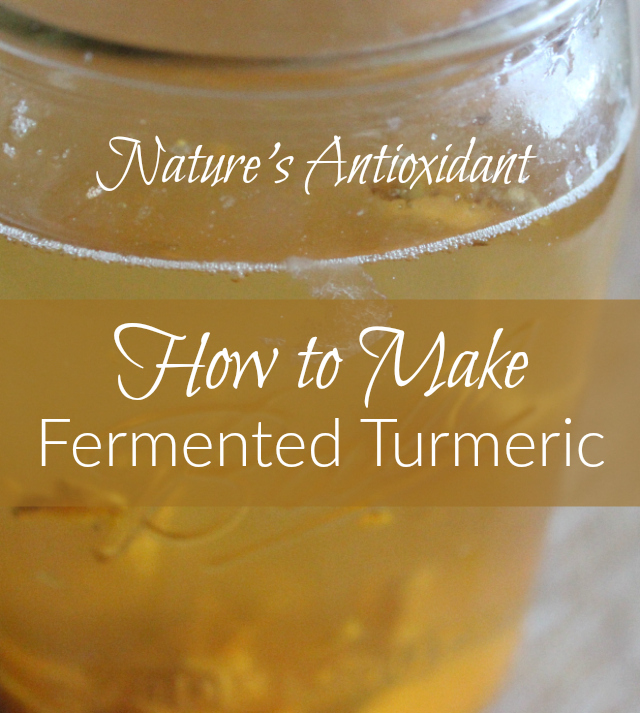 Iam so glad to come across your blog as I am looking for ways to ferment turmeric. I wonder if you try to ferment turmeric pulp ?I regularly juice ginger and turmeric, and I ‘m somehom hesitant to ferment the pulp. I assume you can ferment the pulp! I might put the pulp in water and liquid whey and leave it on the counter with a cloth cover. How do we know that it is more bio-active than unfermented version, and how much more bioactive? does any one know? You can see the activity when the bubbles form. I have not measured this. Hello, I am new to fermentation and all the good stuff about fermentation, so I was wondering how much sugar does one actually consume when you make the tumeric bug and then turn it in to a soda (with only the added sugar in the tumeric bug)? Very little sugar, depending on how long you ferment it. The sugar is the food for the microorganisms. If it tastes sweet then it needs to ferment longer. Hmmm, I’m not sure on this, Anna. I just ferment mine this way, but three months sounds intriguing. This recipe definitely has probiotic qualities. Anything fermented properly does. I would like to minimize my use of sugar, so am I able to ferment the turmeric and ginger with only salt? I don’t have a starter to add to it. Also, I have candida, so would the sugar feed the candida, or is it only feeding the probiotic organisms? If you ferment this before consuming there won’t be sugar left. The longer you ferment the better. You will know by how it tastes. I’ve not tried fermenting with salt, but I would think that would work fine. So, how long would you recommend fermenting it so that all the sugar is gone? Until it doesn’t taste sweet. I think you’ll know. I have been following a recipe that uses coconut oil, tumeric powder and pepper. You heat on low simmer for 10 min and I store in jar in refrigerator. Makes about a pint and lasts two to three weeks. I Take 1-2 teaspoons two times a day. Is there any way to modify your recipe so I can make a larger amount that has more powdered tumeric by letting it ferment in stages? I would think you can modify this. You would want to simmer the coconut oil and pepper. Then stir in fermented turmeric powder and refrigerate I would think.